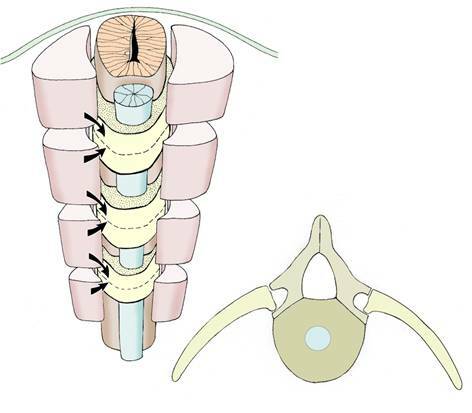 The first skeletal element to appear in the embryo is the notochord, a midline rod which extends forwards from the primitive streak, lying between the ectoderm and endoderm. It is formed from closely-packed, wedge-shaped mesodermal cells. Soon after the notochord is formed, a sheath of collagenous fibres is secreted around it, and it becomes tightly adherent to the underside of the neural plate. The notochord elongates rapidly during its development, and this is thought to play an important part in assisting the neural plate to close and form the neural tube. Later, the skeletal role of the notochord is taken over by the developing vertebral column. The only remnants of this interesting structure in the adult are seen within the intervertebral discs - at the centre of each disc is a gelatinous mass derived from notochordal cells, the nucleus pulposus. The body shows signs of segmentation: there are repeating patterns of organisation - particularly in the trunk region - involving the skeletal, muscular, vascular, and nervous systems. This segmental arrangement has its origins from the somites. 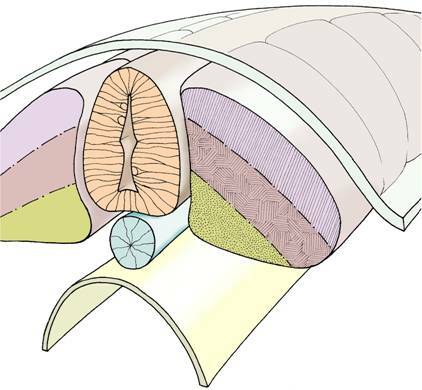 The first signs of segmentation appear during the 4th week when the paraxial mesoderm forms a sequence of somites alongside the neural tube. Eventually, 44 pairs of somites are formed in a cranio-caudal series. When first formed, the somites appear as well-defined blocks of mesodermal cells, almost square in shape from a dorsal view, but wedge-shaped in cross-section, tapering laterally. Many of the component cells become migratory: sclerotomal cells streaming towards the midline structures, dermatomal cells streaming beneath the ectoderm to form the deeper layers of the skin, and the myotomal cells subdividing into a dorsal epimere and a more ventral hypomere. Each somite, and all its derivatives, becomes associated at an early stage with a particular spinal nerve. Even when many of the somite cells migrate to new locations in the embryo, they retain this neural link. Keep this in mind when you are learning about referred pain, patterns of cutaneous innervation, and the nerve supply to muscles. alongside the neural tube (light orange) and notochord (blue). myotome (light brown), and sclerotome (dark yellow). The ectoderm lies above and the endoderm below. above and below each future vertebra. The sclerotomal components of the somites contribute much of the axial skeleton, including the posterior part of the skull, the vertebral column, and the ribs. The remainder of the skull is derived from the mixture of mesodermal and neural crest cells around the brain vesicles, eye, ear & mouth. The appendicular skeleton (ie: the bones of the limbs and their girdles) develops mainly from the mesodermal cores of the limb buds themselves. The pharyngeal arches in the neck region of the embryo also provide skeletal elements in the head and neck region, for example: the ossicles of the ear, the hyoid bone, and the laryngeal cartilages. By the end of the embryonic period (week 8) all the different parts of the skeleton are recognisable, but at this stage they are composed mainly of cartilage or - as in the case of the cranial vault, most of the facial skeleton, and the clavicles - of membrane. Ossification then begins, indicating the start of the fetal period. Ossification continues throughout the fetal period and after birth, being completed by about the 20th year. After this time, significant growth of the skeleton cannot occur, although remodelling continues. If you have the opportunity to look at radiographs of young people, notice the appearance of bones that are still ossifying. Try not to mistake an epiphyseal plate for a fracture. Which parts of the body are derived from somites? Describe development of a vertebra. Are vertebrae 'segmental' or ‘intersegmental'? Explain. Which defect of vertebral development might produce scoliosis? What is a cervical rib? Give an embryological explanation of this defect. Describe ossification of the clavicle. The age of a young person may be estimated by looking at a radiograph of the wrist. How? Briefly describe intramembranous and endochondral ossification. Which drug prescribed in the early 1960's produced many congenital limb deformities? How was this correlation made?